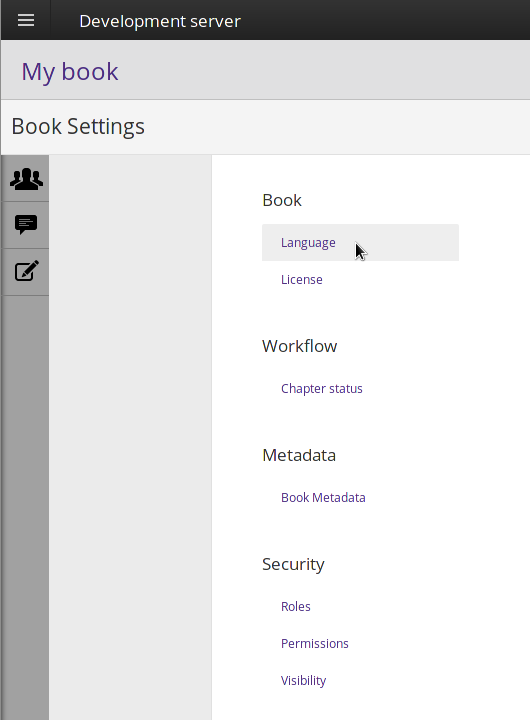 Book Settings is accessed via the cog icon in the upper right corner of the book editing interface. Click on it to change settings for the book you are currently working on. The tab which opens has four sections: Book, Workflow, Metadata and Security, which contain further pages. Click on any of these page names to configure the related settings. 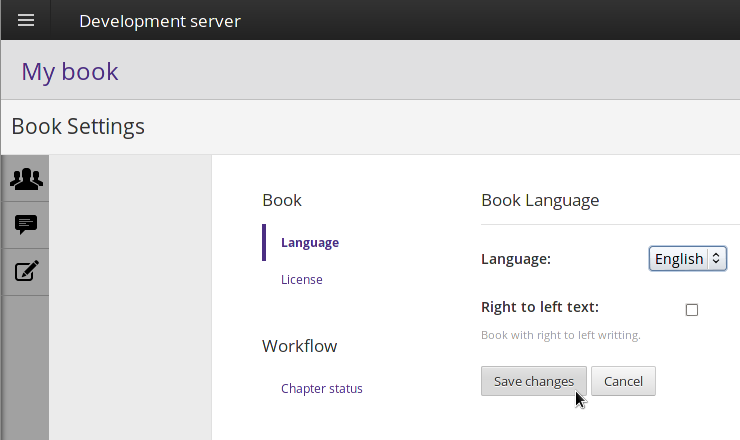 To change the language in which your book is being written, select it from the dropdown Language menu. If the language of the book is written right to left, for example Arabic or Hebrew, check the Right to left text box, which indicates to Booktype that the spine of the printed book should be bound accordingly. Then click the Save changes button. All books created using Booktype will have a copyright license attached. The dropdown menu contains a selection of frequently used copyright licenses. Select your chosen license and click the Save Changes button to save the setting. If you would like to check the details of a particular license, click the link Read full text of the license. A browser tab will open containing a summary of the license, or the full text, depending on the license selected. Users with administrator privileges who have access to the Booktype Control Centre can edit the list of licenses which will be available in this dropdown menu. See the chapter Control Centre for details. 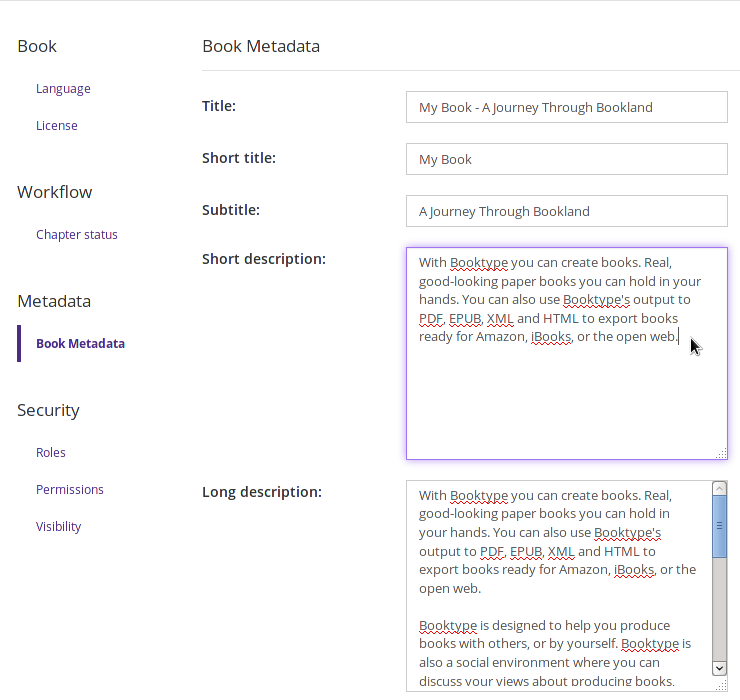 Booktype enables book contributors to edit the statuses that are available for assigning to chapters. By default the chapter statuses are: 'new', 'needs content', 'completed', and 'to be proofed'. You can delete existing statuses, add new ones, and re-order them. The redefined chapter statuses will then be available on the status dropdown at the right side of each chapter's bar in the Table of Contents tab. The Book Metadata page enables you to set the Title, Short title, Subtitle, Short description, Long description, Publisher, Publisher city, Publication date, Copyright year, Copyright holder, Ebook ISBN and Print ISBN for the book. This information can be embedded in electronic outputs for the book, such as EPUB format. 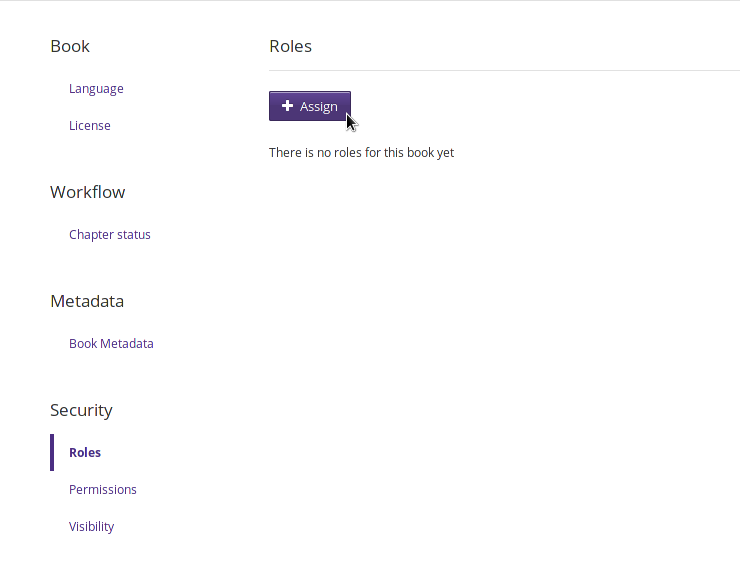 In this page you can optionally assign different roles to the contributors to your book, by clicking the Assign button. For example, the 'Editor' role might be able to change every aspect of the book, but only a contributor with the 'Publisher' role would be allowed to export the book in the output formats available. 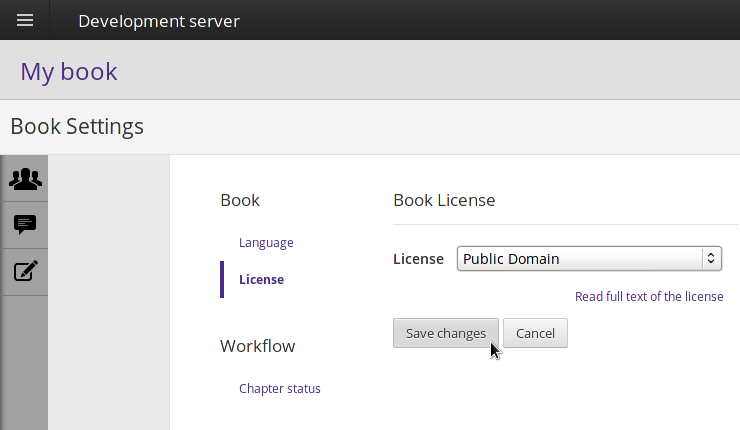 Roles can be created and modified in the Booktype Control Centre by a server administrator. See the Control Centre chapter for more details. 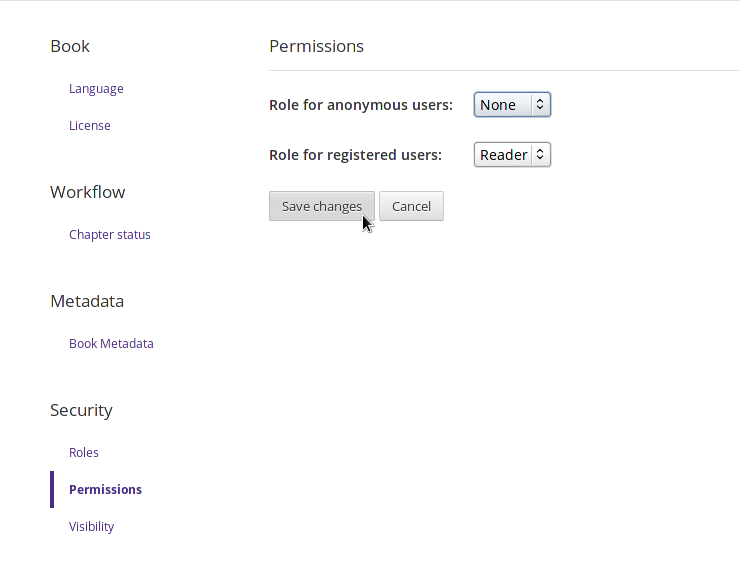 In this page you can set the default roles for anonymous users (the general public) and registered users (people with a login account on the Booktype server). Normally, anonymous users are not given the ability to edit or publish books, due to the risk of spam. Whether you give these powers to registered users, or not, may depend on the general public being able to create user registrations for themselves. For this reason, you may prefer that only administrators are allowed to create new user accounts, using the Control Centre, rather than the public signing up for accounts via the Registration form link in the Sign in box of the Home view. This page enables you to set who can read the book at the current time. Some books are meant for the widest possible readership as soon as possible, while the reading of other books is meant to be restricted to trusted editors and proof-readers until the book is ready for the general public.